The Louisiana State Museum and Sports Hall of Fame is located in Natchitoches, the oldest settlement in the Louisiana Purchase. Set on the banks of the Cane River Lake, the project is inspired by the riverfront setting, early sustainable practices and the 17th century bousillage building technique brought to the region by French settlers. The Museum’s interior reflects the region’s fluvial geomorphology – the transformation of the landscape from centuries of carving by the meandering river. 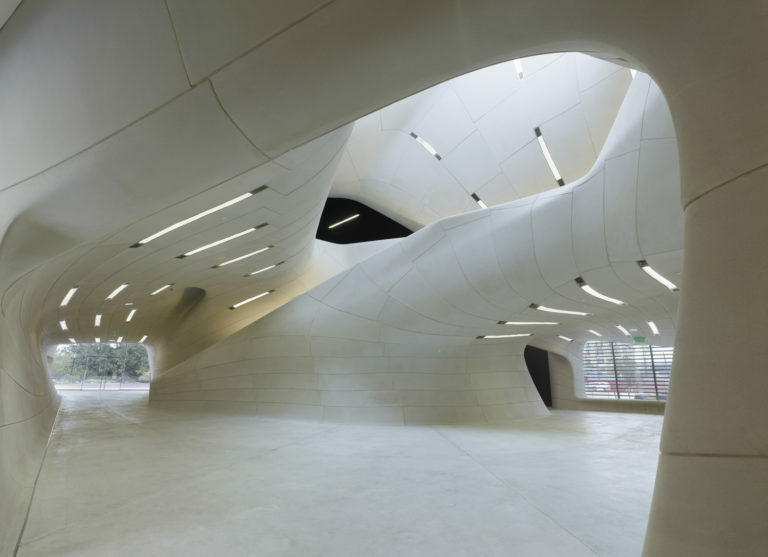 Sculpted from 1,100 unique cast stone panels, the interior seamlessly integrates building systems and serves as a canvas for exhibitions and films. Method Design, Case, Reed Hilderbrand, Lauren Bombet Interiors, LBYD, CSRS, Associated Design Group, Inc., David Kufferman, PE, SH Acoustics, Water Management Consultants & Testing, Inc. The new building provides both an icon for the State and an important community center for the region. 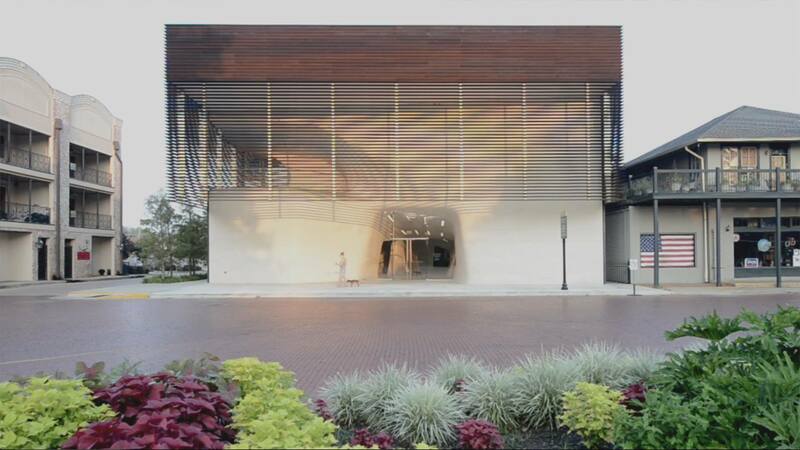 It is a remarkably innovative structure, setting a high standard for public buildings within Louisiana while reflecting the unique characteristics of our distinctive culture and context. The Museum’s interior reflects the region’s fluvial geomorphology – the transformation of the landscape from centuries of carving by the meandering river. 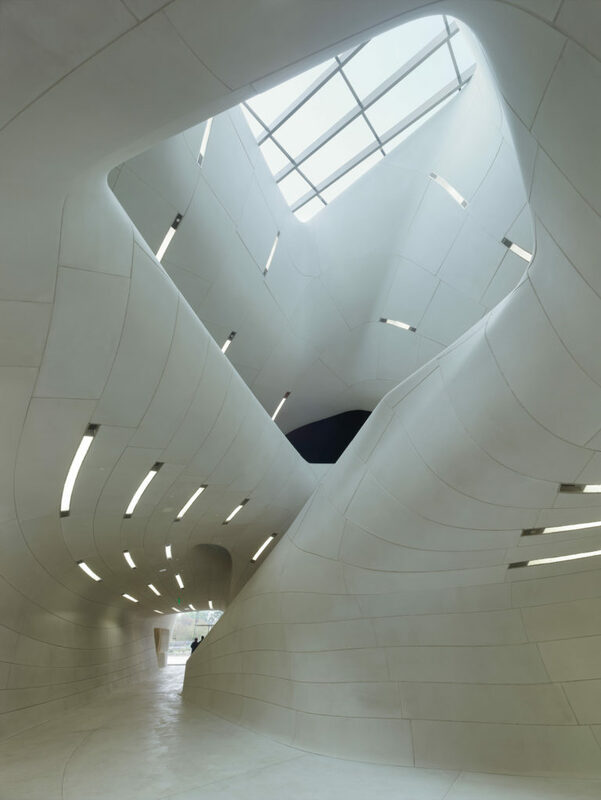 Sculpted from 1,150 unique cast stone panels, the interior seamlessly integrates building systems and serves as a canvas for exhibitions and films. The simple, orthogonal container contrasts with the sinuous interior, highlighting the dialogue between the city and the natural environment. The exterior cladding of pleated copper panels employs surface articulation alluding to the louvers found in nearby plantations, used to control light, views and ventilation. Approaching the colors of the painted metalwork, wood, and earth-toned stucco of the surrounding structures, the twists in the copper strips evoke river flows while also shading interior openings.